Proenza Schouler. This New York brand has been described as cosmopolitan style with a youthful edge. The look is defined by minimalist silhouettes, vibrant colours and sleek pieces with inventive detailing. Founded in 2002 by designers Jack McCollough and Lazaro Hernandez, and named after the designers' mothers' maiden names, the collection was bought in its entirety by Barneys New York. Favoured by Bollywood, Proenza Schouler has been worn by the likes of Kareena, Deepika, Diana Hayden (all featured below using the iconic brand), Sonam, Priyanka, and others. Every brand has its most iconic model and for Proenza Schouler, the PS1 it is. A mix between the lady bag and the satchel, the signature clasp and studs adorn the edges and give it a sophisticated touch. With its utilitarian design, the bag can be carried with or without the removable shoulder strap. The Italian-made leather style is lined with printed-jacquard and finished with ultra cool gunmetal hardware. Click on the link to see what Purse Blog have to say. 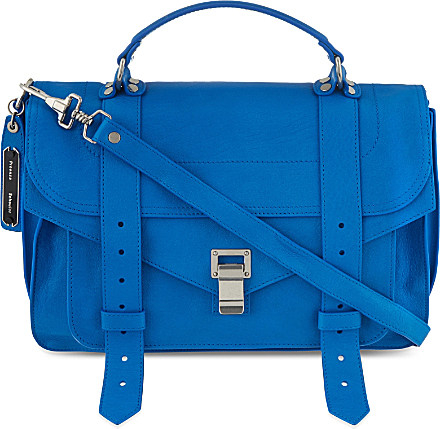 And finally, check out the super stylish Proenza Schouler PS1, medium, we have on our website. In a bright, breezy blue, it is a bag guaranteed to excite, elevate and stand out. Not to mention the super discounted price! Additionally, with our Valentine's 10% discount on top (code: CCVDAY17), the all inclusive 'what you see is what you pay' price and the free shipping, you're totally guaranteed to bag yourself a bargain!